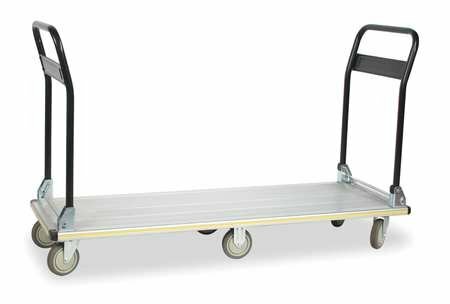 Aluminum Folding Handle Platform Truck - Long Deck is extra long and has six 5” TPR rubber casters. All its wheels are non-marking, which means your floors are protected. Great for maintenance rooms, schools, offices, hospitals and shopping centers as a stock truck or for merchandisers. • Wrap around corner bumper. • TPR rubber non-marking caster wheels. • Six 5" casters, four swivel on ends, two rigid in center. • Handles loads up to 660 lbs. • These platform trucks weigh 44 lbs. This cart is a a dream come true! 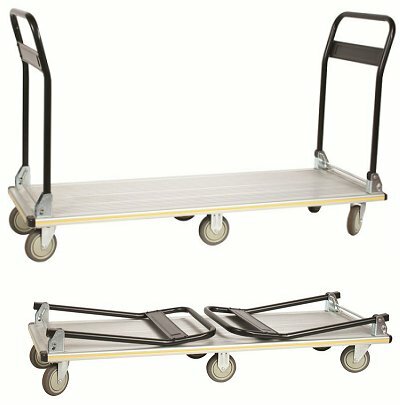 I purchased two of these carts to transport properties from room to room for a week long convention. They are light at 44lbs, yet hold over 600 lbs. They are narrow enough to fit through any doorway and easy to handle. I love the middle wheels which help this cart corner like a dream. They fit in my trunk with the back seats folded down. The double folding handle keeps things on the cart. They are sturdy and can roll down two or three low steps! Don't hesitate to purchase it! Very good truck, I would buy another.